For your product to succeed, it either must be a new idea or be better than a previous one. Unfortunately, there are few tech companies that succeed with new ideas – so a lot take old ideas and refresh them to make ’em better. For example, every Apple product ever created; The iPhone wasn’t the first phone in the world – it was just better than the rest; The iPod wasn’t the first small music player ever created – it was just better because it could hold so many more songs and didn’t need CDs or Cassettes. Okay, so lets take a look at Google+. It’s a great social network that has tons of new features that are definitely in demand. Who would wan’t multi-person video chat, along with a slew of easier to manage privacy features? 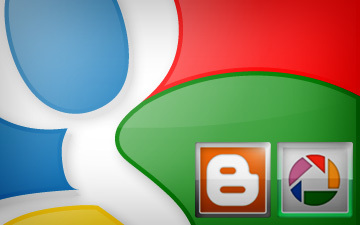 “Okay, so Google+ “better” than facebook – but why isn’t it succeeding?”. This is a question I’ve been asked many times. Lets think about it in terms of a lamp (yes, the one on your desk). First, we have our facebook: A standard lamp with a normal switch that emits very bright light. Then, lets look at our Google+: A large, fancy lamp with pretty designs on it, a bendable neck, and voice activated controls – but we forgot to add in a socket for a lightbulb. In this analogy, our Google+ Lamp is “better” than our facebook lamp – but it doesn’t do what people want to use it for (illumination). Lets take that analogy back to Facebook and Google+. What is the real reason people ever go on facebook? The real reason is their user base. There are very very few people who aren’t on facebook, and there are very very few people on Google+. Google+ has all the new doohickeys and thingamajigs, but it’s forgetting the light bulb (user base). And because nobody is on Google+, nobody wants to join – they’re satisfied with Facebook and their 1500+ “friends.” What’s the use of having a ten person video chat if there’s not even ten people on Google+? Google+ is a good idea, with a perfect execution – but the social networking field has been completely dominated by Facebook and Twitter. It’s unfortunately like this for many social internet startups: many of them rely on a user-base to be the least bit useful, and without a user base you won’t be able to expand your user base. You can get a user base by having a user base, because if you have a small user base people want to join to be part of that user base, which makes more people want to join etc. Hence the reason most social startups fail. Gaining a user-base is a domino effect, with the first domino being a giant brick wall. You need to hope that something will come and knock it over, as getting the domino train started is definitely the hardest aspect of the whole process. Yes, google is retiring the Blogger and Picasa brands over the next 6 weeks, in a push to Google+. Picasa is already integrated into Google+, and will probably end up as solely part of Google+ instead of a separate service. But I don’t know what they plan to do with Blogger. It could possibly be integrated to Google Sites in some way, or it could just be called Google Blogs, or maybe they are going to also integrate it in some way with Google+. Blogger was a wonderful name: founded a few years ago, then purchased by Google, then substantial growth since then. This very blog started on blogger until I moved to WordPress. Not to be mean or anything, but I never liked Picasa. It was a clunky, badly integrated service that only made a little bit of sense. When I saw that Picasa was integrated into Google+ as the photo sharing service, I hit my head against the wall a few times. Although I love Google’s photo sharing efforts, I’m not too sad to see Picasa go. As I said, the retirement will happen over the next 6 weeks. It will be interesting to see exactly how they plan on doing this. During a live facebook event that took place today, Mark Zuckerberg announced that Facebook has partnered with skype to provide one click video chatting to users. It is referred to as a “mini skype client” by the CEO of Skype, and installs with a simple download of a java applet. Zuckerberg claimed that there are no financial agreements with Skype, which is interesting to try and figure out who is benefiting from this. Skype CEO Tony Bates said that “We are planning to add paid skype over time as well.” This means that if you have a skype premium plan, you might be able to group video chat – but that’s just an assumption. Speaking of group video chat, Facebook doesn’t have it! 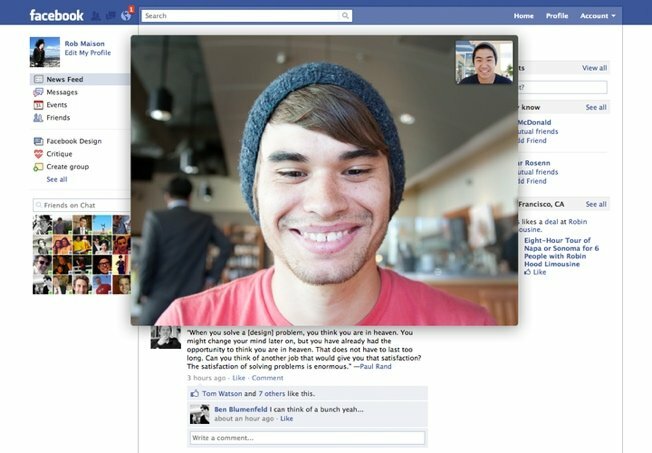 With Google Hangouts, Google’s chat service that allows up to 10 person video calling, may have an advantage over facebook. However, facebook has 750+ Million users – that’s a lot of people that are one click away from a video chat. Video chat is available now to the public, just click here to get started. And the list of tweets will update in realtime. 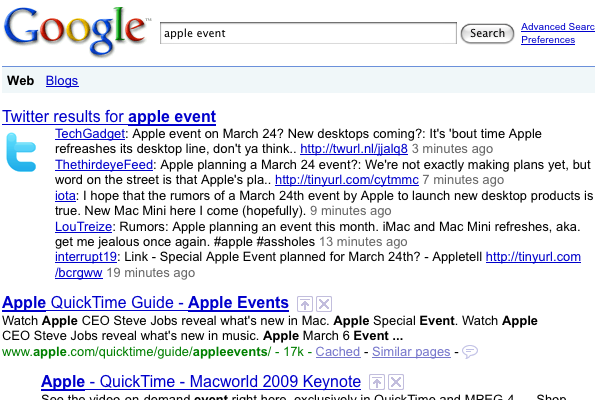 Also, you would find a “Realtime” in the left sidebar. Oddly, that’s all gone! You will no longer see anything in real time, and the realtime search is gone from the left sidebar. There’s a ocuple of theories that could be cause for this. First off, it could be that google is planning on integrating Google+ into their realtime search – but that wouldn’t mean they’d need to remove it. The other possible reason is that google is trying to back off from twitter, considering that they now have a competition going – but until Google+ is fully available, they shouldn’t have any reason to want to hold grudges. Realtime search may be back sometime in the future, but with Google now as a social service, Realtime Search may never be quite the same. Google+ is already available via the web and an Android app, and now Google has submitted their iPhone app to Apple for approval into the app store. Everyone knew that Google was going to develop an iPhone app for Google+ eventually, but we weren’t aware that they had already created a full app and submitted it. If all goes well, the app will be available to iOS users in about two weeks. Who was here for Google Voice? You may remember that the Google Voice app sat waiting for approval for months, and was eventually rejected. Then google resubmitted it, this time not so happy. Apple finally approved it, and I currently have Google Voice on my iPhone. Only time will tell if Apple wants to really battle Google in this way, which could be cause for some kind of lawsuit from Google.